In America there 2 different species commonly grown. The common Crape Myrtle, Lagerstroemia indica, was introduced in 1747 and has been planted throughout the South. Over the years there have been literally hundreds of selections named with variations of flower colors, growth habits and mature sizes based on Lagerstroemia indica. 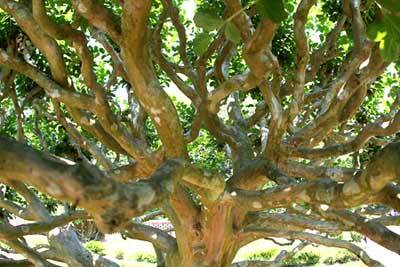 In the 1950's, the Japanese Crape Myrtle, Lagerstroemia faurei, was brought to the United States. This cold-hardy Crape Myrtle, with its beautiful trunk coloration and resistance to powdery mildew, was part of an extensive breeding program at the U.S. National Arboretum conducted by Dr. Don Egolf. The goal of the breeding program was to combine the trunk attributes and powdery mildew resistance of the Japanese Crape Myrtle with the variety of flower colors of the common Crape Myrtle. Dr. Egolf introduced over 30 of these hybrids into the horticultural industry of which the variety ‘Natchez’ has become the most notable selection. Crape Myrtles are available in wide variety of shapes and sizes including Dwarf, Semi-Dwarf, Small Tree, Medium Tree and Large Tree varieties. Larger Trees grow to 20' and higher. 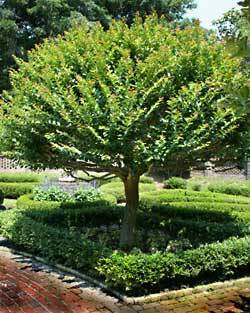 This group is the best choice for single- or multi-stemmed trees. They make attractive street or driveway trees if pruned in an upright form. They are also nice in groupings or as background plants. Small Trees/Large Shrubs grow 10' — 20' tall. This group is the most versatile for accent plantings. They may be trained to a single stem or multi-stem form. 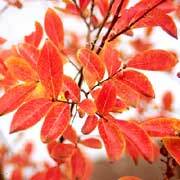 Shrubs grow 5' — 10' tall and range from dwarf types to large shrubs. Trimming in mid to late spring will keep these crape myrtles nice and bushy. They're a good choice for grouping or flowering shrub borders. If carefully selected and sited, they also may be used as foundation plantings. Dwarf Crape Myrtles reach a height of about 2' — 3'. They are well suited for shrub borders in smaller yards or townhouses or as foundation plantings grouped with evergreens. If pruned heavily in the spring, they work well in the sunny perennial border. The wide range of sizes and flower color make crape myrtles one of the essential shrubs or small trees of the southern garden. Not only does the foliage put on a nice fall display, in shades of yellow, orange or red, but the attractive peeling bark is also welcome in the winter landscape, as well. Depending on variety, Crape Myrtles can be grown from USDA hardiness Zones 6 — 10. In Zone 6, even the most cold-hardy varieties will probably be killed to the ground each winter and will be useful only as a shrubby, flowering perennial. They are better adapted to the more humid regions of the country, but will grow in arid climates with supplemental irrigation during dry periods. 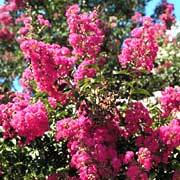 The Crapemyrtle is a very adaptable plant. It grows best in moist, well-drained soils; prefers full sun, and is drought resistant. To produce large flowers and control larger growing cultivars, plants should be severely pruned before the new growth emerges in the Spring. Crape Myrtle blooms are most abundant in soils low in nutrients, especially nitrogen, which can cause a lack of blooms. Throughout the bloom season, additional flowering can be stimulated by fertilization and the removal of faded blooms. 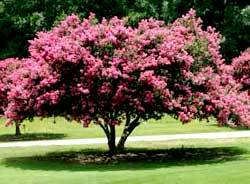 Crapemyrtle must be grown in full sun for satisfactory flowering and to reduce disease problems. Very few insects are pests of crape myrtle. The most important insect pest is the crape myrtle aphid (Tinocallis kahawaluokalani), which is found on the leaves and twigs of crape myrtle. Crape myrtle aphids feed only on crape myrtle trees. Like most aphids, these insects damage crape myrtle by inserting mouthparts into soft tissue and extracting plant sap. Heavy infestations can distort leaves and stunt new growth. It feeds on the underside of crepe myrtle leaves and on twigs and is inconspicuous except for the large amounts of honeydew that it excretes. Drops of honeydew fall from the aphids onto leaves and stems below. A sooty mold grows in the honeydew and appears as a black staining or powdery coating on leaves and stems which, may block light from the leaves and lead to premature foliage drop. The Japanese beetle (Popillia japonica) is also a pest, feeding on both leaves and flowers.